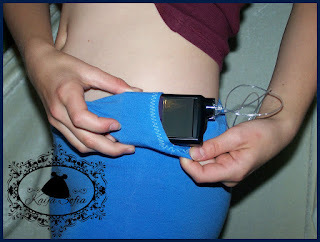 My two type 1 children love their pump belts, but they also love trying new and fashionable ways of wearing their pumps. When I tried making the new "Peg Legs" leggings pattern from Patterns for Pirates, my daughter requested a pair where the waistband could hold her pump. This was her tester pair, and she loves them. If I can find some good fabrics for these, I may be adding them to the shop.